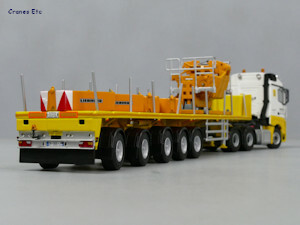 This model is a Mercedes-Benz Arocs MP4 StreamSpace with a 5-axle Ballast Trailer which appears to be a Goldhofer design. 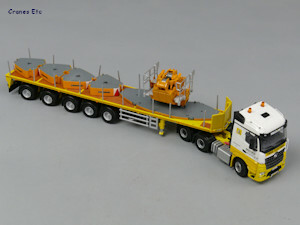 This model is in the colours of Mediaco, the French lifting and transport company. The WSI branded box is their standard design. Inside, the model sits in an expanded polystyrene tray with a clear plastic former and lid. 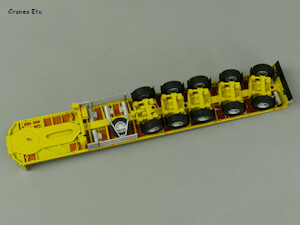 The only assembly required is to join the tractor and trailer together and to fit the optional deck posts. The Arocs has the usual very good transmission and suspension features on the chassis. 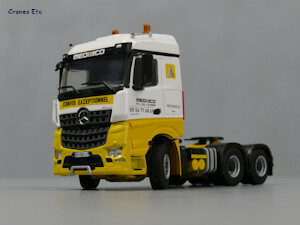 The tyre tread patterns differ on the steering axle, and the wheels are detailed. The front grille looks really good and the lights and graphics are very good. On the roof there are horns, and beacon lights. Inside the cab, the detail level is also good. Under the cab is a detailed engine. Behind the cab there are coiled lines, a fire extinguisher box spot lights, and speed limit signs. At the back the rear lights have plastic lenses. 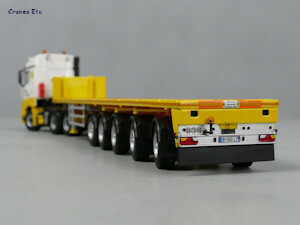 The trailer has a detailed chassis and there are tanks and a spare wheel. The side bars are plastic. The wheels and tyres are smart. 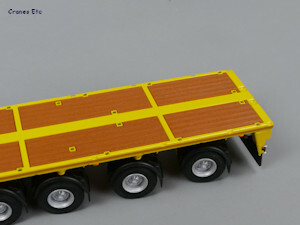 The trailer deck has plastic replica timber inserts, and there are some small graphics, but there is no trailer branding, possibly because Mediaco does not operate a Goldhofer trailer like this. The rear detailing is very good and there is a large stiff plastic mud flap. A separate pack of metal deck posts are provided and these plug into holes in the deck edge. The Arocs has good steering and a reasonable angle can be achieved. 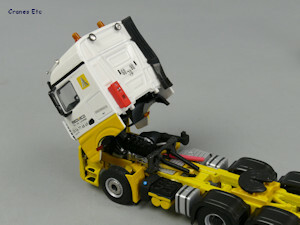 It has a fully tilting cab, but the review model would not pose in a tilted position. 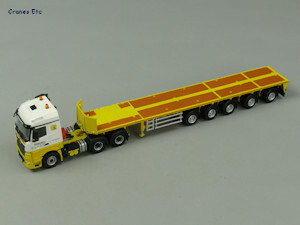 The five axle trailer has very good linked and proportional steering on axles 2 to 5. Axle 1 can be raised out of service. 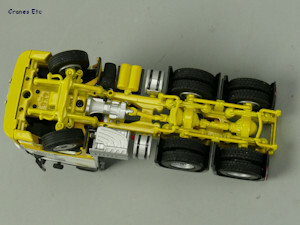 Each axle has independent working suspension. Landing legs can be unscrewed and lowered but they could not retract fully. Deck posts can be fitted if desired although some sit loose in their holes and can lean. 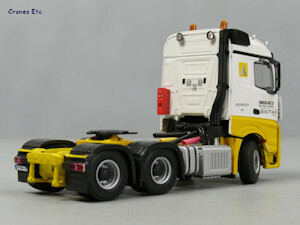 The overall quality level of the model is high with a high metal content and careful use of plastic. The model is good value as a limited edition. 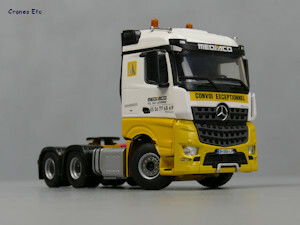 Mediaco has a very attractive colour scheme and so this model looks very good, and it would pose well with other models in Mediaco colours. 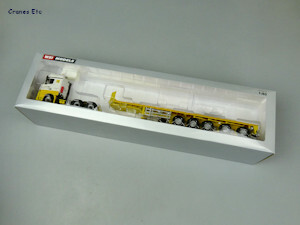 This model appeared in July 2018. 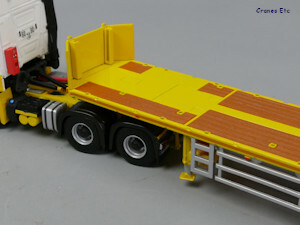 The truck without deck posts installed. Cab does not pose tilted without assistance. Landing legs cannot fully retract. 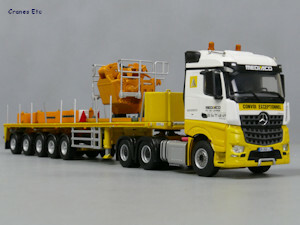 Loaded with Liebherr crane parts.